Intently listening to Letter from an Unknown Woman (Max Ophuls, 1953) is like watching the film for the first time: being surprised again by its fluidity and getting caught up in the smooth progression of the story, guided by the music. Letter is operating within the framework of classical Hollywood cinema, creating a sense of spontaneity through a strict structure. As Claudia Gorbman notes, music serves the classical Hollywood film style through its “inaudibility” and subordination to the film narrative, creating a sense of continuity and unity (1). But rather than simply analysing this use of music in Letter, I want to explore the notion of music as a metaphor for Ophuls’ film style. Musical concepts like rhythm, pace, and the use of themes and variations can help us understand the mixed feelings Letter arouses. The story of Letter from an Unknown Woman is the stuff of tearjerkers. 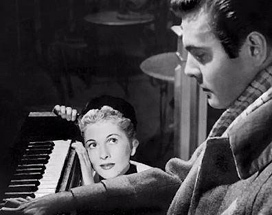 Lisa Berndle (Joan Fontaine), a Viennese girl, falls in love with pianist Stefan Brand (Louis Jourdan), a neighbour who is hardly aware of her existence. When she has to move to the small town of Linz, Lisa saves herself for Stefan and rejects the love of a young lieutenant. Back in Vienna, she works in Mme Spitzer’s fashion salon. Day after day she awaits Stefan in the street after work, but he never takes any notice of her, until a romantic evening in the Prater amusement park leads to a one-night affair and her pregnancy. After Stefan disappears from her life, Lisa gives birth to a child, Stefan Junior, and marries Johann Staufer, a wealthy man. Years later, Stefan notices Lisa in the opera and pursues her. When she realises he doesn’t recognise her, she flees from him, but her husband sees their meeting and challenges Stefan to a duel. Meanwhile, Stefan Junior has died from typhus, and a sick Lisa, soon to die too, writes her story in a letter to Stefan. In the film, the story is narrated through flashbacks, motivated by Stefan’s reading the letter before the duel. Ophuls turns this emotional story into classical melodrama with a twist, adding both visual refinement and distanced irony. Rather than merely underscoring the images in a traditional way, the music adds another dimension of commentary, sometimes at odds with Lisa’s voice-over narration. To Susan M. White, the music actually moves from supplement to deconstructor of the visual. It almost puts the spoken word in the background, or at least acts as one of the voices in the “polylogue”: of the soundtrack (2). To begin with, it is useful to point out how music is central to Letter on a number of levels. The story is set in Vienna, musical town par excellence, a city generally associated with operetta and Strauss waltzes. Most of the screen action is accompanied by music, and quite a lot of it is diegetic. More predictably, non-diegetic music is used extensively to set the mood of a scene. Ophuls takes this characteristic Hollywood practice to an extreme, creating a strikingly close relationship between image and sound, leading the critic Claude Beylie to refer to a “synchronisme audio-visuel” (3). While camera movements are often singled out in discussions of Ophuls’ work as corresponding to the characters’ emotional and psychological states, I would like to argue that music fulfils exactly the same function, and perhaps in a more straightforward manner. Music may be considered Ophuls’ aural counterpart to movement. The original score for Letter was composed by Daniele Amfitheatrof. It is strongly inspired by the other music used in the film, which is mostly by Strauss and Mozart, but also by Liszt (the central theme) and Schubert (the Madame Spitzer sequence). This choice of music sets the general tone of old-world European refinement. The music of Strauss, in particular, efficiently situates the story in place and time, complementing the film’s opening title, “Vienna about 1900”. As Gorbman points out, this is a customary use of music: “If one hears Strauss-like waltzes in the strings, it must be turn-of-the-century Vienna” (4). Apart from situating the story, this type of music also has the advantage of quickly and clearly denoting moods. In Letter, the mood of individual scenes is often set aurally rather than visually. The opening sequence offers a clear example. When Stefan starts to read the letter – “By the time you read this letter, I may be dead” – ominous drums and strings swell on the soundtrack (shot 7), announcing doom and despair. In contrast, when Lisa remembers how Stefan’s furniture was moved in (shots 11–14), playful hurdy-gurdy fairground music suggests Lisa’s childish wonder and delight. In turn, this mechanical sound contrasts with Stefan’s romantic and virtuoso piano music in the following sequence (shots 15–27, discussed below). Lisa’s naive curiosity has evolved into romantic adoration, and music plays a significant role in signalling this change of mood. Music doesn’t only signal emotional change, it also often coincides with the beginning of onscreen action. Gorbman identifies the co-ordination of music and action as a Hollywood convention allowing music to remain unobtrusive (5) but in Ophuls’ work the matching of the two is often so close as to draw attention to itself in an almost mannerist way. One of many such parallels between mise en scène and music occurs in the first shot, where the music stops as the carriage bringing Stefan home comes to a halt. Later, when Stefan asks the driver of another carriage to stop in order to buy flowers (shot 134), the music starts a new movement. Throughout the film, non-diegetic music is used in this way to set the atmosphere, most often closely following onscreen action. For instance, predictably, background music swells in both scenes where Lisa and Stefan kiss (shots 182 and 308). The relationship between diegetic music and images is less straightforward. Whereas non-diegetic music is clearly selected to set the tone of a scene, diegetic music suggests spontaneity. It is introduced as music that “happens to be there”, a soundtrack to the character’s lives. This seemingly casual relationship between the events and the music permits the establishment of connections other than exact matching, without disrupting the impression realism. 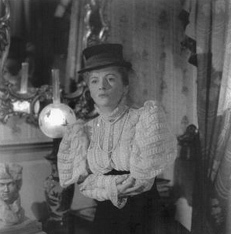 Claudia Gorbman observes the ironic possibilities this offers: as diegetic music is played, it comments on a scene while appearing “indifferent” to the dramatic situation (6). This ironic potential is fully exploited in Letter, where most of the diegetic music comments on the action in this distanced way. The film’s central romantic encounter in the “Prater” sequence provides a clear instance of music expressing feelings and simultaneously ironically commenting on them. The sequence is accompanied throughout by fairground music, instead of the predictable romantic strings. The music is cheerful and charming, but also childish and mechanical. It effectively evokes the atmosphere of the amusement park, but reduces the potential emotional impact of the scene, particularly when the all-female orchestra gives a heavy and tired rendition of the waltz Stefan will later repeat for Lisa. All the same, Lisa and Stefan dance in supreme bliss (shots 165-172). This lack of “fit” between music and images suggests the incompatibility of Lisa and Stefan’s emotions. While Lisa thinks her dreams of romantic love are being fulfilled, Stefan considers their encounter to be just another affair. As Thomas Elsaesser puts it, the fairground music and setting is used “to underscore the main action and at the same time ‘ease’ the melodramatic impact by providing an ironic parallelism” (7). The clearest example of diegetic music commenting on onscreen action is offered by the Linz sequence, in which Lisa declines the lieutenant’s marriage proposal (shots 85–93). This sequence verges on comedy: it is accompanied by an awkward rendition of a Wagner tune by a military brass band. The music sharply contrasts with Stefan’s virtuosic, sensuous piano playing, and adds an ironic ring to the lieutenant’s claim that “we also have good music here”. The music also warns the viewers that they are about to see a shallow performance, a bad re-enactment of a marriage proposal that both begins together with the music and ends with it, followed by an ironic round of applause. The bombastic music clearly indicates how the scene is to be interpreted, removing the seriousness from a potentially painful and dramatic scene. The effect is particularly pronounced because of the obtrusiveness and sheer volume of the music. At the end of the scene, the brass band plays the Radetzky March and temporarily silences the characters, reducing the subsequent announcement of the failed pairing to the parents to pantomime. In both cases, the diegetic music seemingly “happens” to add a dimension to the events. Music is one of the devices used to make clear what is not apparent in the images alone. But like Lisa’s voice-over, the music’s relationship to the image is never univocal. It is one of the voices in this many-voiced film, and the comparison with a part-song isn’t far-fetched. To further support this reading, it should be clear that the diegetic music’s ironic underscoring of onscreen action forms part of a larger pattern of distancing throughout the film. Instead of fully exploiting the melodramatic potential of the story, Ophuls counterbalances it. Thus, heavily emotional sequences are often followed by lighter ones. For instance, after the confusion following Lisa’s declination of the Lieutenant’s marriage proposal comes the joyous mood at Mme Spitzer’s. Similarly, romantic scenes are frequently disrupted, as when Lisa dreamily listens to Stefan playing the piano and a friend disturbs her, flatly saying “I wish he’d stop that noise” (shot 21). All these elements conspire to create Letter‘s ambiguous and contradictory texture. I think, and this is nearly an axiom with me, that there are as many creators to a film as there are people who work on it. My job as director consists of making, out of this choir of people, a creator of films (11). 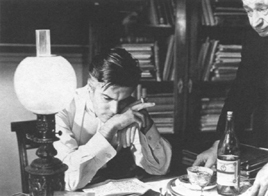 If Ophuls is frequently compared to a conductor, his films can equally be compared to operas, and not only because many of them, including Letter, contain opera sequences. Allan Williams claims that opera as spectacle is a key metaphor both for Ophuls’ films and for the universes these films portray (12). In another sense, Avrom Fleishman identifies the trope of love-death in Letter with the “long train of moribund lovers” in opera (13). I would like to take this argument further and demonstrate how not only music in general, but also specific aspects of music can be metaphorically used to describe Letter. Of these, rhythm and pace are the most powerful: part of the natural fluidity of the narrative in Letter seems to stem from Ophuls’ tight control of rhythm and pace. Take, for instance, the sequence intercutting images of Stefan playing the piano with images of Lisa and a friend (shots 15–28). First we see Stefan’s fingers, peacefully playing the theme of the Liszt étude (shot 15, lasting six music beats). Then, the camera moves down from a window to Lisa dreamily listening on the swing (shot 16, ten beats). She almost moves to the beat of the music, and so does the camera (shot 17 to 19, one, two and four beats respectively). Different camera angles show different perspectives, but the pace stays slow. Then, another longer shot of Stefan playing (shot 20, six beats). After this establishment of a harmonious situation, the disruption begins. Lisa’s friend arrives (shot 21, nine beats), Stefan plays more agitatedly (shot 22, eight beats). After talking to her friend, Lisa hears Stefan is having difficulties with the music, and looks attentively up at the window (shot 23, 25 beats). Now a dramatic tension is built up, in the music as well as in the pace of cutting. Three shots of Stefan struggling with the music (shot 24, three beats; shot 25, five beats; shot 26, three beats; beats shortening). The music stops, and Lisa jumps up (shot 27, four beats). Stefan slams the lid of his piano (shot 28, two beats). The sequence has a little climax, like a wordless struggle. Music and movement are delicately paced, and convey an abstract beauty. The camera follows Lisa’s soft swinging, and her friend’s movement across the screen left, right, and left again. Stefan’s fingers and body grow tenser and tenser as the music reaches its climax, and Lisa’s mood changes from dreamy to annoyed to worried as Stefan gets entangled in a difficult passage. On other occasions, rhythm isn’t conveyed through shot-length, but through the pace of onscreen movement. A good example is offered by the scene in which Lisa escapes from the train station when she has to leave Vienna (shots 69 to 73). Lisa stands completely still throughout her father-in-law’s frantic performance with the luggage. She then says “Suddenly, I knew couldn’t live without you”, and quietly sneaks away as languishing violins underline her feelings. First hesitantly, then swiftly, she runs out of the station. In shot 70, we see her jumping off a streetcar. In her haste, she drops her purse, and slows down to pick it up. She walks quickly towards Stefan’s house, then starts running when we hear her voice-over saying “…to throw myself at your feet”. When she finishes her sentence (“nothing else mattered”), she stands still and rings the bell, twice, impatiently. When she gets in (shot 73), she runs up the stairs, the music reaching a climax. She knocks twice, impatiently. There’s no response, and the music slows down again as she knocks a third time. As in the previous example, sound and movement create a rhythmic pattern. As a whole, the scene moves towards a climax (the arrival at Stefan’s door), evoking Lisa’s uncontrollable desire for Stefan. Within this overall movement, the tempo increases and decreases, alternately showing Lisa determined and hesitant. The emotional strength of the sequence is mirrored and enhanced by its powerful construction. Like the various mood shifts throughout the film, these changes in pace may reflect Lisa’s insecurity and instability as a woman in love. The clearest reflection of this changeability is to be found in Lisa’s facial expressions, which during her final visit to Stefan’s apartment change so regularly as to rhythmically pace the scene. One moment she is radiant with belief, hope and love; the next she is disappointed, hurt, and desperate. 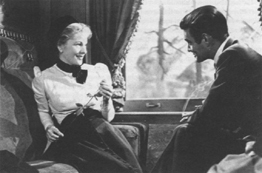 Joan Fontaine’s acting seems to visualise the speeding up and slowing down of Lisa’s heartbeat. A particularly fine rhythmic pattern is present in all three of Lisa and Stefan’s romantic encounters. In each of them, Lisa is initially mobile, but becomes still in Stefan’s presence. Robin Wood calls this figure “the movement/stasis opposition” (14). The first time, Lisa runs out of the garden when she hears Stefan has stopped playing; arriving at the door, she walks up and down; finally, when she sees Stefan coming, she stands absolutely still (shots 30–32). The second time, she swiftly walks out of Mme Spitzer’s; arriving at Stefan’s house, she slowly paces the street; when he arrives, she stands completely still (shots 102–104). The third time, she quickly leaves the opera; she paces in front of the side entrance; Stefan stops her (shots 235–237). All three meetings have three parts, similar in pace. Three is the key number in this film, parallelling the three beats of the waltz-measure. If we consider the Linz-sequence as an intermezzo (set apart in tone and by the absence of Stefan), the film has three parts, illustrating the three phases of Lisa’s love: burgeoning, blooming and fading. Each part depicts the building up of emotional tension, leading to a climax, followed by an anticlimax: longing, meeting, and parting. Within this overall pattern of threes, further triple movements can be distinguished. For instance, on their second meeting, Lisa and Stefan start talking. Their three short conversations, standing still in the snow, are followed by three short walks. When, within this scene, Stefan first sees Lisa, he gives her one, long stare. When they start walking, he throws her two glances. The second time they start walking, he throws her three glances. These repetitions and progressions may be mere coincidences, but they create a persistent sense of rhythm. While the musical metaphor is less direct here, Letter can also be viewed as containing abstract patterns of themes and variations, repetitions, motifs, refrains and echoes. Like a score – and particularly, like its own score – Letter is a complex text with multiple internal references. Or as Stephen Heath puts it: “the film is gathered up in a whole series of rhymes in which elements – of both ‘form’ and ‘content’ – are found, shifted, and turned back symmetrically, as in a mirror”. Heath sees this as a characteristic trait of classical cinema, a balance between difference and recurring images (15) Ophuls takes this characteristic to its expressive extremes. To begin with, the film’s score contains themes and echoes. Letter has one principal theme, which links scenes together, and gradually gains in connotative weight. When we first see Stefan, he plays Liszt’s piano étude No. 3 in D Flat major (Un Sospiro). Lisa doesn’t see Stefan on this occasion, but at this time her interest in him awakens. The principal melody of this étude comes to signify “Stefan”, as it is repeated on several occasions, once literally, but more often incorporated in Amfitheatrof’s score. The theme is audible when Lisa thinks about Stefan as she secretly wanders around in his house (shot 50); when she returns home after escaping from the train station (shots 73 and 78); and when she pays him her final visit (shots 280 and 197). It is also the film’s love theme, first heard during the opening credits, and last when Lisa finishes her letter, writing “I love you now as I’ve always loved you” (shot 326). It not only refers to Stefan, but also to Lisa’s love for him, and her memories of him. Memory is central in Letter, and is signalled through musical echoes. For instance, when Stefan recalls some scenes after reading the letter, “his” theme is mixed with the music played at the Prater (shot 329–336). Similarly, when Lisa revisits the café, we hear a slow version of the street music she heard the first time. The tune is also vaguely audible when Lisa cries at the window after putting Stefan Junior to bed (shot 268). Thus, as diegetic music returns in the film’s original score, it links scenes together, and adds to the film’s unity. The notion of “theme and variations” also operates metaphorically. The film’s visual and aural texture resembles that of its score, where elements of diegetic and non-diegetic music are repeated and varied upon. Given their complexity, it is impossible to identify all these patterns on a single viewing. Nevertheless, like the musical themes, they create an impression of coherence. They also create a sense of déjà-vu, reflecting the central theme of memory, and stressing the inescapable tragedy of Lisa’s love. Everything returns, but she blindly believes things are going to change. The most obvious examples of visual repetition are the “twinned” scenes, almost literal repetitions, or as George Wilson calls them, “echoing with a variation” (16). The most famous examples of this “echoing” are the staircase shots. In shot 80, Lisa awaits Stefan’s return at the top of the stairs. The camera “looks” over her shoulder as we see Stefan arriving with a girl. Later in shot 181, the camera makes the same movement, and we see Stefan and Lisa coming home together. The visual similarity encourages the viewer to compare the two situations. On the one hand, Lisa takes the place of the girl in the first shot, and turns out to be just another girl in the row. On the other hand, she’s different, wearing a black, modest coat and remaining silent, whereas the other girl wore pale, frilly clothes and giggled. The second staircase shot is much more solemn than the first one, and betrays Lisa’s sincerity as Stefan goes through his practiced routine. Musically, it would be a move from allegro to andante. From this repetition, Wilson deduces Lisa’s blindness to her own situation, because she doesn’t seem to realise she’s just one out of many (17). Robin Wood also states that the viewer is allowed a position of ironic detachment that is not available to Lisa, but he acknowledges the complexity of the effect. Instead of taking it as simple irony, he calls for attention to differences as well as similarities (18). I would like to take the argument further, stressing the ambiguity of the twinned shots. At the moment she tells the story, Lisa sees things differently from when she lived them. The events showed may represent her perception at the time, while the mise en scène may be a reflection of her current understanding. Rather than a comment on her blindness, the parallel camera movements may be a way to externalise her realisation. If most authors acknowledge the presence of different voices in the film, they seldom consider Lisa’s voice-over as different from her voice in the story. Avrom Fleishman is exceptional in stating that “Lisa’s narration is explicit about her subjectivity, both what she feels in commenting on past events and what she felt when participating in them” (19), though Gallagher too distinguishes between “Lisa as narrator” and “Lisa as subject”. So again, an openness of meaning lies beneath the surface of clear-cut melodrama. Letter constantly challenges the viewer to dismiss easy interpretations: contradictory emotions coexist, and both protagonists are portrayed with a large amount of ambiguity. It is not easy to dismiss Lisa as a romantic fool or Stefan as a heartless womaniser, partly due to the multiplicity of voices in this part-song, each implying a different attitude towards the facts. The ambivalence of our response to Lisa, and indeed the ambiguity in almost every reading of the film, may come to be seen as appropriate to the medley of viewpoints that the film orchestrates (20). Besides musical and visual repetitions, a further layer of meaning is provided by aural repetitions in dialogue. An innocuous example of such echoes can be found in Stefan’s talk with the porter: “Who is it?” – “Brand” – “Good morning, Mr Brand” (shots 3, 79 and 180). Other recurrences in the dialogue operate like themes and variations. For instance, Stefan repeatedly mentions that he hardly knows anything about Lisa, but that she never tells him much: “You know you don’t talk very much” (shots 130–131); “I know almost nothing about you” (shot 161); “I know so little about you” (shot 193); “Who are you?” (shot 249). He also suggests that Lisa knows him better than he himself does: “How long have you been hiding in my piano?” (shot 132); “Is there anything about me you don’t know?” (shot 141); “You know far too much about me already” (shot 161); “I feel that you understand what I can’t even say” (shot 247). His memory is another theme throughout the film: “I’ve seen you before” (shot 109); “How else could we dance this way unless we’ve danced together before? And yet if we had, I should have remembered” (shot 173); “I’ve seen you somewhere, I know” (shot 238). Stefan’s words sound like hollow pick-up lines, but his insistence suggests a genuine internal restlessness, thus adding to the complexity of his portrayal. Robin Wood considers these “refrains” part of the film’s musical rhythm, carrying overtones of irony and poignancy (21). The chatter about music, talents and fatherhood in the final part of the film provides a painfully ironic case in point. When Lisa and Johann put Stefan Junior to bed, Stefan says his music teacher thinks he has a natural talent for music, which effectively reminds Johann who Stefan’s real father is (shots 210–211). The scene also contains a reference to Lisa’s love affair. Stefan Junior’s harmonica is made in Switzerland, and he says it must be a very nice place (shot 210), unaware of the fact that his mother visited Switzerland in a mock train on the evening he was conceived. If anyone might have the missed the point about talents, the theme returns in the following sequence, at the opera. Some people talk about Stefan’s failed musical career. When a man says that with that talent, he could have been a great pianist, a woman replies that perhaps he had too many talents, obviously hinting at his licentiousness (shots 223–224). The ultimate sting comes in the scene after their return from the opera. Stefan Junior follows his mother’s advice to call Johann “father”, just when this position becomes unclear after his mother has met his real father again (shot 267). Ophuls becomes particularly ironic when melodrama reaches its highest peaks. Music is a powerful signifier of atmosphere, and more than any other filmic element, functions on the level of emotions rather than that of intellectual understanding. In Letter, it is used in two distinct ways: the soundtrack both reinforces the mood of the images and contradicts it. This double use of music corresponds to a tension in the film as a whole. On the one hand, Letter is a typical Hollywood narrative, preserving a high degree of unity, as every element has a clear function in telling the story. On the other hand, the film is highly self-reflexive, suggesting multiple meanings, breaking through appearances, and uncovering internal contradictions. Music is one of the multiple voices telling the story, but the story itself is also musical. Repetitions and variations occur in the narrative as they do in the score, and rhythmical patterns and changes in pace typify the images as much as the soundtrack. Thus, music isn’t only an important storytelling device for Ophuls, but also a powerful metaphor to describe his work. Claudia Gorbman, Unheard Melodies: Narrative Film Music, BFI, London, 1987, pp 76–91. Susan M. White, The Cinema of Max Ophuls: Magisterial Vision and the Figure of Woman, Columbia University Press, New York, 1995, p. 136. Claude Beylie, Max Ophuls, Seghers, Paris, 1963, p. 88. Robin Wood, “Ewig hin der Liebe Glück”, in V.W. Wexman & K. Hollinger (eds), Letter from an Unknown Woman, Rutgers U.P., New Jersey, 1991, pp. 220–236 and 223. Claude Beylie, 1963, p. 109. Tag Gallagher, “Max Ophuls: A New Art – But Who Notices?” Senses of Cinema 22, 2002. Andrew Sarris, Interviews with Film Directors, Discus, New York, 1969, p. 360. My emphasis. Williams, 1976, pp 140 and 144. Avrom Fleishman, Narrated Films, Johns Hopkins U.P., Baltimore, 1992, p. 161. Robin Wood, “Letter from an Unknown Woman: The Double Narrative”, cineACTION, 31 (1993), pp. 4–17, 5. Stephen Heath, “The Question Oshima”, in V.W. Wexman & K. Hollinger, Letter from an Unknown Woman (New Jersey: Rutgers U.P., 1991), pp. 244–248, 247. George M. Wilson, “Max Ophuls’ Letter from an Unknown Woman”, in G.M. Wilson, Narration in Light: Studies in Cinematic Point of View, Johns Hopkins University Press, Baltimore, 1986, pp 103–125, 104. Fleishman, 1992 , p. 154. Alexander Dhoest is a postdoctoral researcher FWO-Flanders at the Communication Sciences Department of the Katholieke Universiteit Leuven.